Believe it or not, sometimes I really don't feel like cooking and last night was one of those rare nights. Perhaps it was because I had made cupcakes before dinner and I wasn't hungry. Anyway, I know that it's healthier to eat at home and so I decided to make something easy instead of going out or ordering carry out. This dish is simple to prepare and also very delicious. Perfect for when you don't want to spend a lot of time in the kitchen. Note: This recipe only serves two if the polenta is cut into circles. You will get slightly more servings if you cut into squares or serve creamy instead. Spray a casserole dish lightly with canola oil and set aside. In a large sauce pan, heat vegetable stock to a rolling boil and whisk in polenta, making sure there are no lumps. Add fresh herbs and season with salt and pepper and reduce heat to low. While polenta is simmering, stir constantly with a wooden spoon to avoid polenta from scorching. Polenta will take about 30-35 minutes to cook. The grains will become soft and pull away from the sides of the pan. During cooking you may need to add a small amount of vegetable stock if too much liquid is absorbed before cornmeal is soft. Just before pouring into casserole dish, or serving as is, stir in nutritional yeast and butter. Immediately pour into casserole dish and smooth with a wooden spoon and shimmy pan until polenta is even and smooth. Chill for about an hour and cut with a cookie cutter in circles or squares. Heat a saute pan on medium and add olive oil. Dredge polenta in flour and place in frying pan and fry until golden brown on both sides about five minutes per side. Heat sauce pan on medium-low heat, add olive oil, onions and garlic and cook for about five minutes. Add all other ingredients, bring to a boil and reduce to a simmer and cook for about 30-45 minutes for flavors to combine, stirring often. Square off the sides of the zucchini and dice into 1/2" size pieces. Heat a saute pan on medium-high heat, add olive oil and fry zucchini (in two batches) until golden brown, about 3 minutes. You want them to be crisp tender. 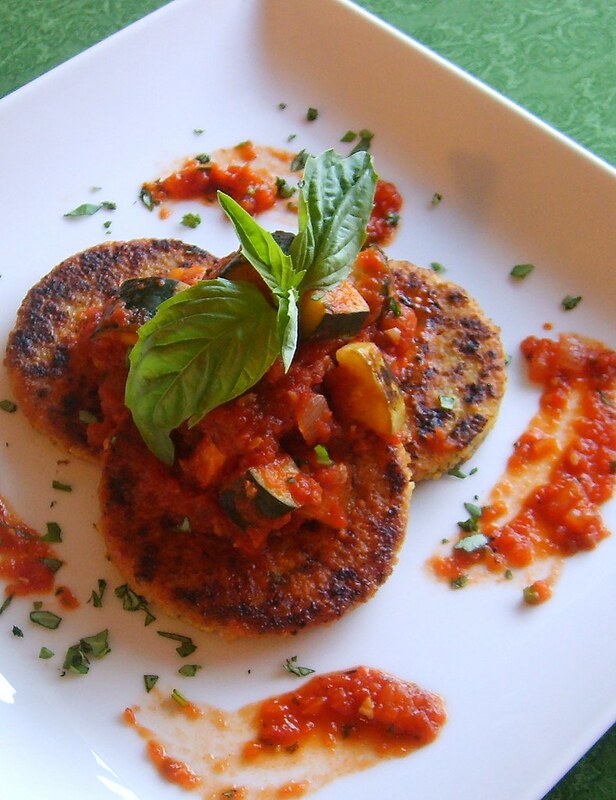 When finished frying, add zucchini to tomato sauce and stir to combine. Serve squash ragu over polenta and garnish with fresh basil.